How does it feel, being ignored? You pick up the phone and get voicemail. You email and get no reply back. You text only to be ignored. In the world of fast paced jets, communication moves at the speed of idle dirt. Dealing with aircraft maintenance supply chain partners is a chore. It's like babysitting a child that doesn't listen. Nowadays, we have social communication mediums like Facebook, Twitter, Whatsapp, and the ancient phone, text and email. Yet, listening and communication skills are at an all time low. It's a mind numbing epidemic. 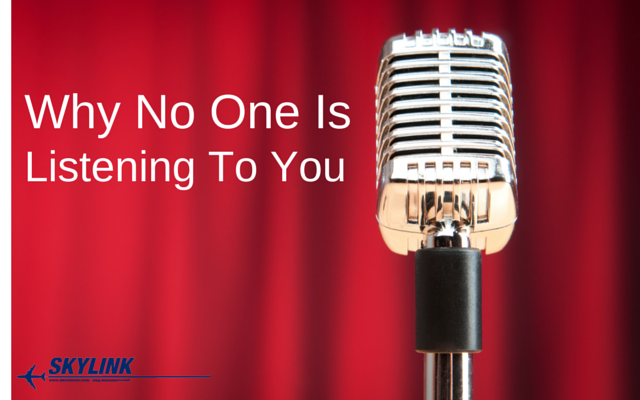 So why are people not listening to you? Why does it seem like nobody cares? When supply chain partners don't actively engage you in a conversation, it's not a you problem, it's a who problem. It's very common to have a need and to have to pull teeth to work through a problem and find a solution. The person you should be relying on most is out to lunch with their phone turned off. They say "I-care-a-lot-about-you" but actions speak louder than words. This is why we have 24/7 dedicated Account Managers. You can contact them personally any time you want. People who we can create the greatest value for and who benefits from our solutions has entire access to their Account Manager. It's about creating a "WOW" experience. When you're not being heard and you identify it's a who problem, look at your options and figure out another way. Another big issue it the constant pressure of demands, it could be you doing the demanding or the other party. Constant demands will have the other party running. Communicating and listening together is entirely different. Here's a great example. We had a new customer contact us and every time we engaged them in a solution for their rotable RFQ needs, they would demand a "cheaper" price. It was never good enough and pretty soon we became disengaged. With the prices we were quoting they got 100% logistical support, 24/7 access to a dedicated Account Manager and unparalleled service. They know that they can trust us and we do as we say. There's no having to babysit us. In this particular situation it was a matter of $100 that they demanded we come down to. It was a constant demand of lowering prices and a constant demand of shipping things faster than agreed upon. Every time we worked with this client it was a demand. It was never collaborative. Are demands sometime necessary? Yes, of course, but doing more demanding and less communication and collaborating gets most people nowhere. Listening is much more productive than talking and it's a critical flaw in a lot of supply chain partners communication style. Know the who and watch out for the constant demands. Do you feel like your constantly ignored? Do your supply chain partners have a listening problem? Well fear no more my friend. Fill out the form below and let's show you how good listening skills is done.